Children and adults love to jump and bounce, sometimes for hours, for play and exercise. Trampolines are a fantastic way to stay healthy and fit. With many new technological advancements, they have become safer than ever before. We don't see many trampolines without strong reinforced nets for safety, but here are a few safety innovations you may not have heard of. Springfree trampolines have eliminated the traditional spring system and offer a wider jumping surface and a softer bounce. The AlleyOOP Double Bed is actually two trampolines. You can bounce on the top bed, and the second bed is eight inches below. When the bottom bed engages, it takes stress off knees and joints and creates a much softer and more controlled bounce. A great deal of the kickback force of the top bed is removed and offers less displacement when there are multiple jumpers. A Surestep Trampoline Ladder is easy to assemble and is non-permanent, so that it can be removed easily in order to limit access to the trampoline. In addition to having lasting weather protection, the two-step ladder fits most trampolines between 33 inches and 37 inches tall and has large, flat platform steps. A Pro Flex Basketball Hoop is designed specifically to be used with AlleyOOP Safety Enclosures. It attaches securely and comes with a reinforced full-size backboard, a cushioned hoop, heavy-duty hardware, and a five-inch inflatable basketball. 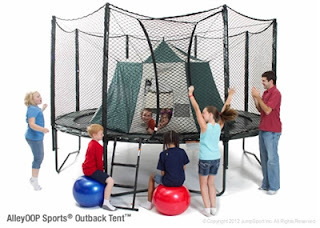 An Outback Tent can be used for daytime adventures or sleepovers. Made specifically for AlleyOOP and JumpSport Sports Safety Enclosures on 12 to 14 foot round trampolines, this giant 11-feet-across and 5.5 feet high tent has a netted/screened zippered door and three windows, a full floor, and attaches easily to the Safety Enclosure in under five minutes. No poles are used; the tent uses bungee cords that are suspended to the bottom and top of the enclosure. Check out Play N Learn’s Playground Superstores for a wonderful selection of the safest trampolines on the market that will give many hours of fun to enthusiasts of all ages.